We are excited to announce that we are officially open in our new location at 900 Junction Drive in Allen, Texas! We want you to join us for our official Grand Opening on Saturday, August 11 from 4:30-7:30! We’re going to have kids’ activities and open gyms from 4:30-6:00, and then for parents we’re going to have an adult mixer from 6:00-7:30. There’s going to be food and fun! We’ll have face painting, a waterslide, mini horses, and since we have temperatures in the 90s and 100s, of course, we’ll have snow cones! Make sure you and your kiddo bring a bathing suit and a towel! 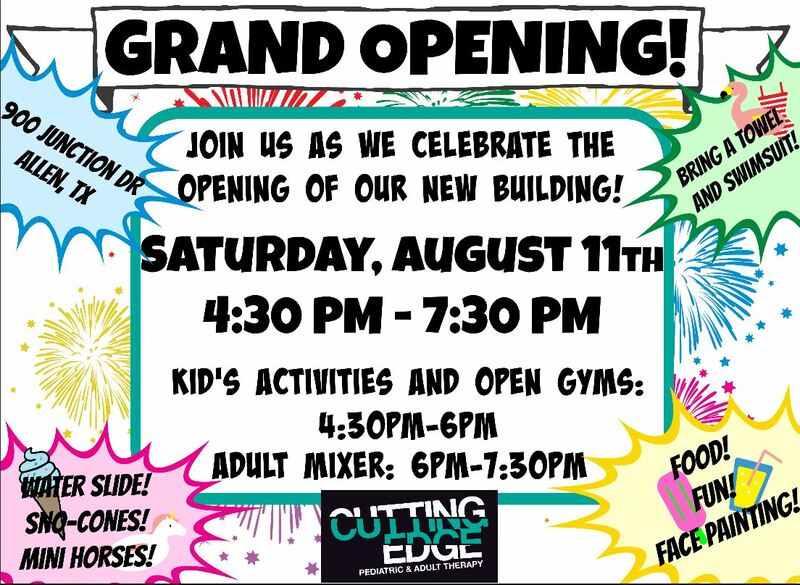 We can’t wait to have you over to tour our new facility and join in on all the fun! See you on the 11th!